Above: Chocolate Butter Shortbread. Photography by Eric Swanson. 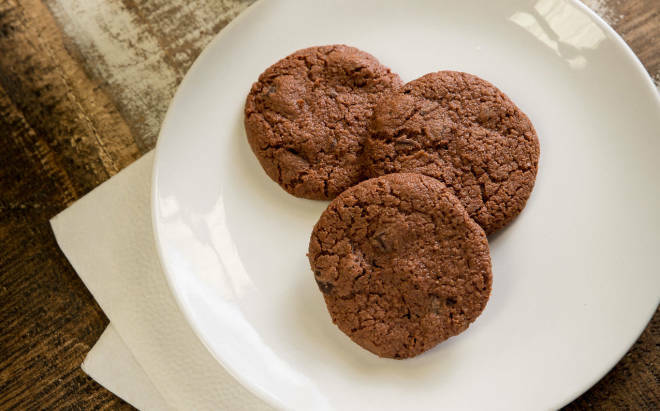 These melt-in-your mouth cookies are far superior to store-bought shortbread, Sciscenti says. Made with a blend of gluten-free ingredients (look for them at your natural foods store) they can also be made vegan if you substitute coconut oil or palm fruit oil for the butter. Preheat oven to 375°. Line 2 half-sheet trays with parchment paper or silicone baking mats. In the bowl of a standing mixer, using the paddle attachment, beat the butter, sugar, melted chocolate, and salt on medium speed until light and fluffy. In a separate bowl, stir together the arrowroot, tapioca, and oat flour. Turn the mixer to low, add the flour mixture into the butter mixture, and mix well, pausing to scrape down the sides of the bowl. Slowly mix in the chopped chocolate until just incorporated. Roll the dough into 2-ounce balls (about the size of a small golf ball) and place on parchment, about 12 per tray. Flatten into disks, then refrigerate for 30 minutes. Lower the oven to 350° and bake for 16 minutes. Rotate the tray and bake for another 12 minutes or until the edges begin to turn brown. Cool for 5 minutes then transfer cookies onto a tray and let cool completely. Store in an airtight container (if you don’t eat them all! ).